Apartment Staubbachblick Lauterbrunnen Apartment Staubbachblick Lauterbrunnen is on the first floor of a semi-detached chalet located in Lauterbrunnen. There is a full kitchen with a microwave and a coffee machine. Ferienwohnung Bahnhöfli In a central location of Lauterbrunnen, 50 metres from the train station and the cable car to Grütschalp, Mürren and the Schilthorn Ski Areas, Ferienwohnung Bahnhöfli provides a restaurant and an apartment with terrace. Free WiFi, free parking and breakfast are available. Apartment Grosshorn Lauterbrunnen Offering wireless internet, the 2 levels apartment Grosshorn Lauterbrunnen is located by a road, in a detached, sunny position, 1 km from the skiing area. The apartment is provided with radio and a TV with Satellite and international channels. On the 1st floor there is one room with a double bed. Apartment Staubbach, Wasserfall Lauterbrunnen Apartment Staubbach, Wasserfall Lauterbrunnen is a self-catering accommodation located in Lauterbrunnen. Offers free Wi-Fi access and three bedrooms for six persons. Camping Jungfrau - Holiday Park price per day from CHF 180 . Valley Hostel price per day from CHF 32 . Hotel Silberhorn price per day from € 73 The Silberhorn Hotel in Lauterbrunnen is situated off the main street, only 150 metres from the train station, providing access to the skiing and hiking areas. 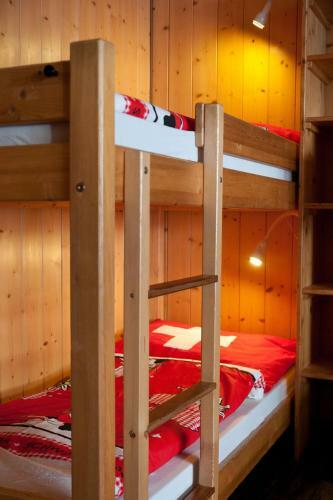 All rooms feature solid wooden furniture and a private bathroom. Hotel Oberland price per day from € 65 The charming, historic and family-run Hotel Oberland in the centre of Lauterbrunnen is only a 5-minute walk away from the train station and the Staubbach waterfall is close by. Chalet Rosa price per day from CHF 240 . Hotel Crystal price per day from CHF 210 Crystal Hotel is located in the heart of Lauterbrunnen. The train station and a bus stop are a few steps away. All of the spacious and modern rooms provide cable TV, a seating area and bathrooms. 25. Slight right onto Hauptstrasse. 27. Continue onto Auf der Fuhren. 28. Turn right onto Fuhren. 29. Slight left onto Gässli. Ski resort Aeschi, number of cross country pistes: 20km. 18 km from town of Lauterbrunnen. Ski resort Adelboden, number of cross country pistes: 86km. 29 km from town of Lauterbrunnen. Ski resort Adelboden-Lenk, number of ski pistes: 176. 34 km from town of Lauterbrunnen.